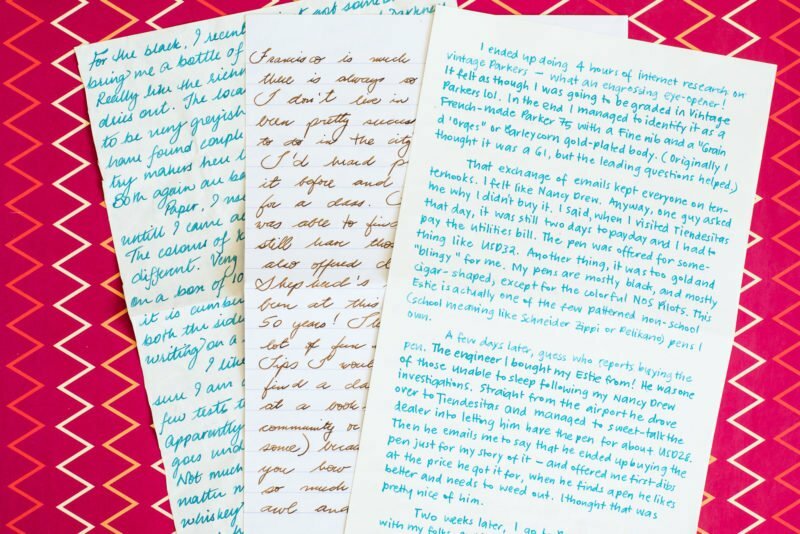 One of the most satisfying ways to use your fountain pens is to write to other people. When you do this, it’s not only you who gets to enjoy your pens, but the recipient as well. One of the most traditional uses of a pen is to write a letter. If you don’t have anyone you can write a letter to, there’s always the option of writing to a pen pal. A pen pal is basically someone that you write to and exchange letters with on a regular basis. You may or may not know this person, but right off the bat you know that you have one thing in common… you like to write! Although initially you might not know each other, you eventually start to learn. 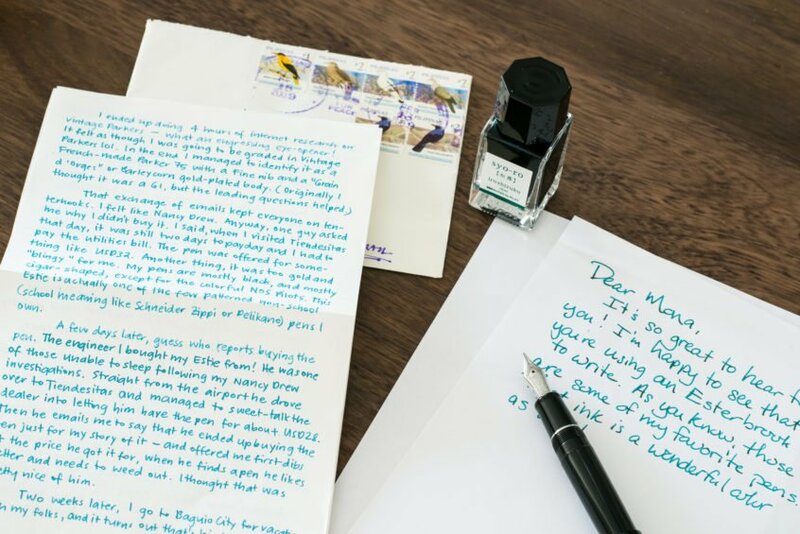 If you write to someone who uses fountain pens, entire letters can be devoted to just talking about pens, inks and paper! One great part of having pen pals is that you can find them all over the world. I currently have pen pals who live in the United States, the United Kingdom and India. In the past, I’ve received letters from pen pals living in Australia, New Zealand, the Philippines, and Canada. If you have any interest in another part of the world or practicing a different language, a foreign pen pal can be wonderful! 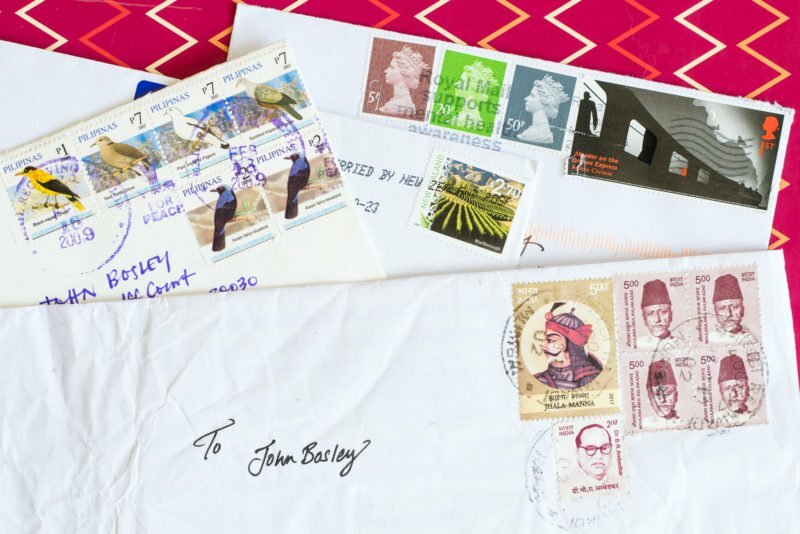 Stamps and letters from pen pals around the world. Thanks to online communities, finding pen pals is easier than ever. There are many different places you can start your pen pal search. I have found most of mine through the Fountain Pen Network. There are also a few subreddits you might try: r/FountainPenPals and r/penpals. One site that I’ve been meaning to try but haven’t yet is LetterWriters.org. You get to see a variety of pens, inks and paper when you have different pen pals. One thing to note is that it can initially be a little difficult to find a good pen pal match. Even if you do find a good match, don’t be surprised if you only receive one or two letters from some people and then they stop writing. People these days are busy and while it sounds like a great idea to have someone to write to, sometimes life gets in the way and finding the time to sit down and write a letter can be difficult. This can lead to dropped communication between some people. Don’t take it personally. It’s happened to almost everyone that I know who’s ever had a pen pal, so the chances of it happening to you at some point are pretty good. If you’re wondering what to write about, the first place to start is something that you have in common. Usually this is fountain pens! Be sure to mention which paper, pen and ink you’re using to write with, as it’s very helpful to know what different inks and pens look like when they write and what different papers look and feel like. Other easy topics are where you live (or have lived), what you do for a living, and other hobbies you have. Don’t worry if you feel like you’re rambling as you write. The first few letters can be a little difficult and it might seem like you’re just talking about yourself, but pretty soon you’ll have plenty to write about. As long as you enjoy the process of writing and getting to know someone, having a pen pal should be very rewarding for you.